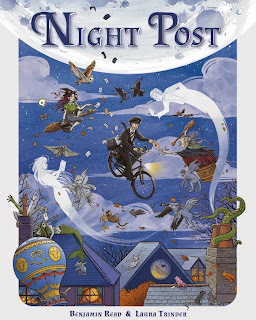 Halloween Spotlight - Don't miss the "Night Post" by Benjamin Read and Laura Trinder - Coming soon from Improper Books! "Night Post" by Benjamin Read and Laura Trinder (Improper Books) - Properly gorgeous! What's it about? It's a twilight gaze behind the scenes at "The Other Postal Service" - A service that takes place during the wee small hours, to ensure that witches, werewolves and ghosts all get their mail. 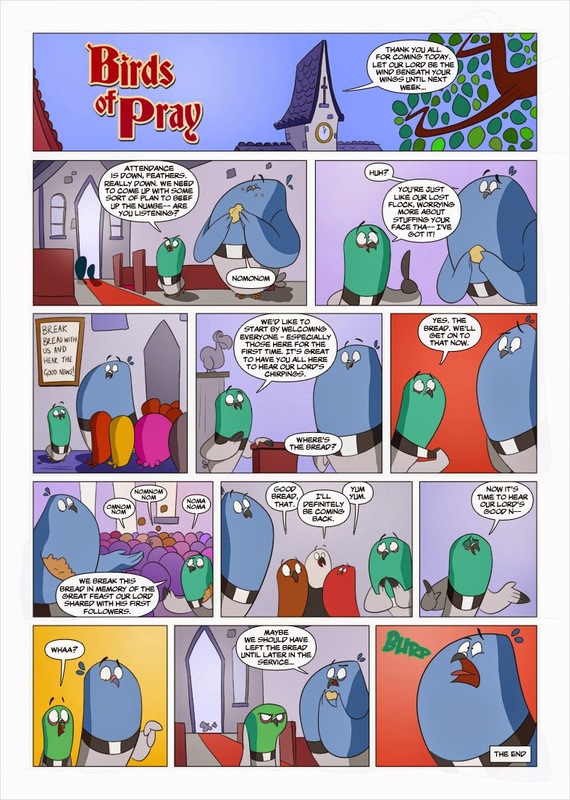 This is a comic suitable for all ages - and there's a twist. We see the night-time world of "Night Post" through the eyes of a central character (the night postman), and the tale is told entirely visually. No speech balloons, no dialogue, just glorious and gorgeous artwork to impart the postie's tale as he ensures the night mail is delivered on time. "Night Post started from my longstanding childhood belief that midnight is a special hour, and strange things can happen as it strikes,’ said Benjamin, about this amazing wordless comic ‘The story of our beleaguered Postie has offered a wonderful chance for me and Laura to explore our mutual love of the spookier side of things, whilst having a great deal of fun at the same time. Building the world of the Night Post and then watching Laura bring it to life or, in some cases, death, and layer it with the most painstaking details - watch out for the Infinitesimal Animals - has been brilliant"
"I'm a huge fan of Raymond Briggs and we wear our influences unashamedly on our sleeve with Night Post - it shows a slice-of-life of a man's day at a very special job, and is told purely by pictures. No captions, no word balloons, just intricate, detailed art. It's the kind of book I adored as a kid, and still do now, and it's been a pleasure to write." You know that thing you sometimes get when you see something SO GOOD that you can hardly breathe until you've shared it with EVERYONE? Yeah, that's "Night Post". "Night Post" will be available from Improper Books on the 12th November 2014. Do NOT miss our full review coming up on the blog very soon! Our Halloween Top Ten Children's Books! We can't resist jumping on a halloween-ey bandwagon if we spot one (moving aside a few pumpkins and skeletons so we can actually fit on) so we thought we'd share our updated Halloween Top Ten Children's Picture Books. In no particular order, let the ghoulish games begin! We've read this book again, and again, and again and we still can't get enough of it. Take one little boy named Bernard, throw in a rather preoccupied Mum and Dad, and a monster who lives in the garden and watch the story unfold with plenty of hilarious twists and turns. 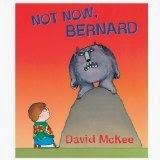 If you've never encountered Bernard and the Monster, Halloween is the best time to do so! A witchy tale with a difference this, with the sublime and original story of a lonely witch and her confectionary creation Cake Girl. 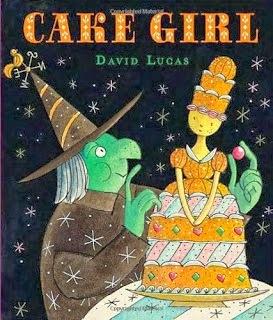 On her birthday a witch creates a marvellous cake-shaped girl but what is a girl without life? A few spells later and the witch finds Cake Girl to be a charming companion. But Cake Girl wants more out of life. After all, why should the witch have all the magical fun! So when the witch bestows her magic powers on Cake Girl, what will happen next? This is a simple but extremely charming story and it's as delicious to read as it is to flick through and gaze in wonder at the gorgeous illustrations. As sweet as a nut! This is one CRAZY book. 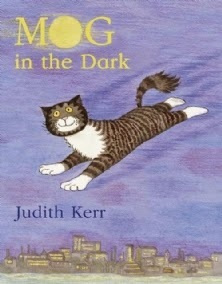 You may be familiar with lovely Judith Kerr's most brilliant feline creation Mog, but what happens when this lovely old lady lets the veil slip a little - and shows us a slightly surreal and dark insight into cat nightmares in "Mog in the Dark". It's almost as if Judith Kerr woke up one morning and said "Oh bother to drawing all that cute stuff, I'm going to let rip!" - and let rip she does in such deliciously dark style that we cannot resist this book! Imagine The Island of Doctor Moreau crossed with a serious acid trip and you're probably on the way to describing this particularly dark and gorgeous episode in Mog's adventurous life. We LOVE it! We do love a good monster tale, oh yes we do! "Harry and the Monster" by Sue Mongredien and Nick East dips into the recurring nightmare of a young boy who nightly falls asleep and dreams of a huge nasty dribbling snarling monster! EEK! This isn't a cuddly monster. This isn't a nice monster, he's an absolute rotter but don't lose heart just yet, there's a nicely delivered twist at the end that flips things entirely around! 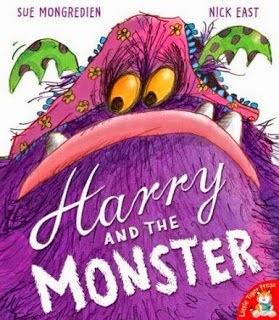 Find out what happens to Harry in the end, in this particularly brilliant monster tale! Special mention to Nick East's artwork which is utterly glorious in this! 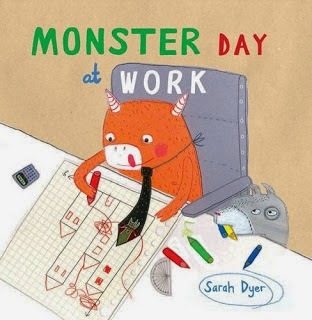 A rather marvellous monster book from Sarah Dyer and though it's not particularly spooky or scary, it does show that monsters have a life outside running around scaring the bejesus out of people. Find out what happens during the average day at work for an office-bound monster! We particularly loved the monster lunch! This is a darkly delicious gothic tale that's kid-friendly but features more than its fair share of ghostly goings on. 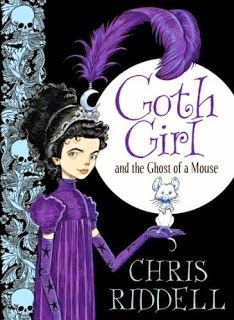 The most adorable ghost of all though is the Ghost Mouse of the title, a glorious little fellow named Ishmael who meets young Ada Goth and embarks on their first adventure together. This is so brilliant, illustrated throughout in Chris's brilliant penmanship with an utterly wonderful little mini-adventure for Ishmael tucked into the back cover. 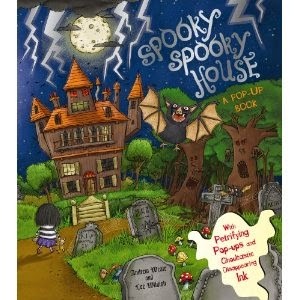 No better way to introduce your little ones to all things gothic! LOVE!! A lift-the-flap delight that's bound to send a shiver down your spine. "Spooky Spooky House" by Andrew Weale and Lee Wildish teases you at every page turn with calamitous and spooky goings on in a rattleshack old house. Dare you discover the demonic delights within? It's an awesome book, like a literary ramble around a haunted house with a ton of brilliant little touches tucked away between its covers. 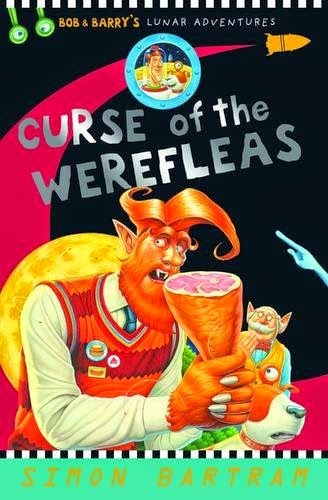 Definitely suitable for younger readers who will love the flaps and will love the final (not really) terrifying reveal at the end of the book! This book completely blew our tiny little minds when it first arrived, clad in a very dark black box, nestling in dark paper. It's since become a real favourite at bedtimes despite its rather dark content. 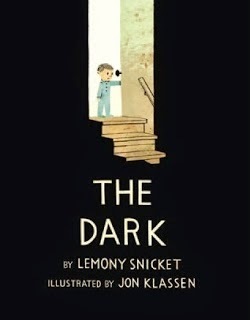 It's the story of Laszlo, a little boy who lives in a huge (and sometimes very dark) house. Laszlo isn't really sure he likes the dark as it nestles in the basement or behind the shower curtain in his house. One night, Laszlo's night light goes off - and suddenly the dark creeps into Laszlo's room! EEEEEEK! Read on though, it's such a fantastic tale with a brilliant pay-off, from two utterly talented chaps! An absolute belter of a pair of tales from Jonathan Stroud, introducing us to an alternate reality where ghosts are a lot more dangerous than the whispy ghosties we're used to. This is fantastic storytelling, harking back to a time when children's ghost stories didn't wrap the reader up in cotton wool and were properly spooky and scary. We meet Lockwood, Lucy and George - a team of mini-ghostbusters who become one of London's most respected team of spectre-smashers! An absolutely glorious book that's perhaps more hilarious than spooky but it's such a lot of fun to flick through and read the tale of young Ella. Strange things keep happening in her house, and she can't believe that there's a supernatural explanation for these goings-on. But can you spot the naughty little ghosties tucked away in each page spread? 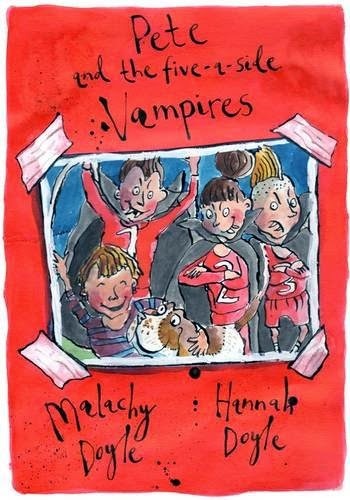 A brilliantly satisfying halloween-flavoured book that's destined to become a firm favourite with your little banshees and ghouls! Join Nicola L. Robinson on the Society of Children's Book Writers and Illustrators' exploration of all things monstery! 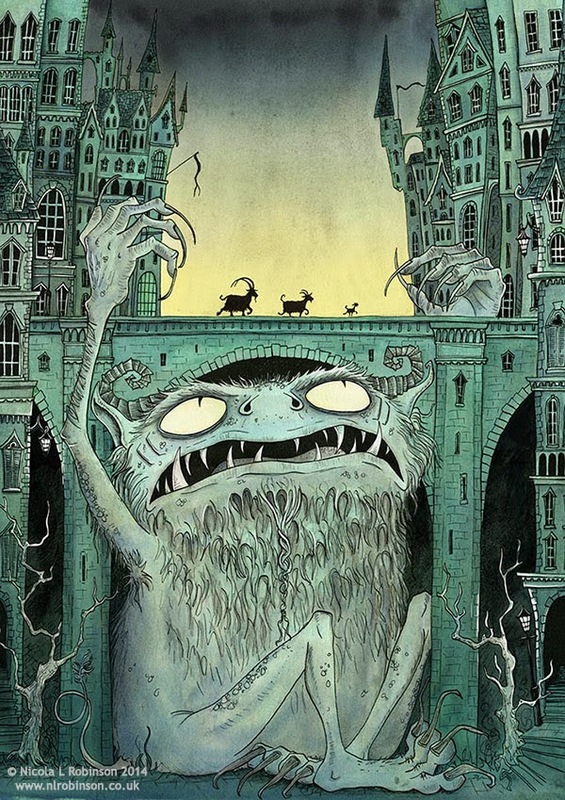 There are monstrous goings-on over at the Society of Children's Book Writers and Illustrators blog "Words and Pictures". Long-time fave of ours, the very talented Nicola L. Robinson has come up with a guest post for the blog that is a fabulous exploration of "The Anatomy of a Monster", inviting us all to unleash our imagination and come up with our own monster creations during Halloween. Check out the blog post via the link, and also stop by Nicola's awesome website too! Also, in case you missed it, have a look at Nicola's fantastic book "The Monster Machine" in our review. I know you'll probably accuse us of playing favourites on the blog from time to time. Certain authors and illustrators hit our Book of the Week slot with consummate ease and Emma Chichester-Clark recently found her way into our hearts with her awesome "Plumdog" book. We're currently marvelling at her latest children's book which is just so good that once again it's deserving of our Book of the Week accolade. In "Bears Don't Read" we meet a rather large but thankfully quite placid grizzly bear named George who isn't really satisfied with his life. "Is this all there is?" he muses as he stares out across the wonderful scenery of the valley where he lives, watching his brothers and sisters, nieces and nephews all seemingly happy with their grizzly bear lives. 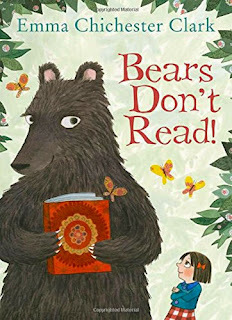 Everything changes when the bear finds a book that someone has lost in the forest. A book, showing the most wonderful things - and suddenly the bear realises that there is indeed more to life, and more books out there. From that moment on, George is determined to track down the owner of the book and see if they will teach him to read too. His family think he's crazy and sadly wave George off as he embarks on the long long journey into town to find people, and hopefully a willing teacher. The next scene, once George hits town, is Charlotte's favourite spread in the whole book. You can imagine the scene as a giant grizzly pops up. Poor George doesn't know why everyone's running (including a couple of very familiar looking dogs that made Charlotte quite literally clap with glee!) - but he manages to ask a passer by where his book might've come from. The school, of course the school! The school is attended by a little girl, Clementine. Could she hold the key to fulfilling George's dearest wish, to learn to read himself? I'm trying not to gush about the rest of the book, there are scenes in this that are so expertly handled by Emma - for instance when George is confronted by a rather menacing set of riot police, the scene is actually quite scary for little ones. Thankfully there are no guns, no violence - and in reality the rather loud and pompous police chief might not be such a bad egg after all. OK no more spoilers. This book celebrates the sheer joy of reading, the possibilities it opens up - and one bear's ultimate wish to join those of us who know the greatest pleasure of wrapping ourselves up in fantastic books - books such as this in fact - and losing ourselves in their brilliant worlds. Charlotte's best bit: That fabulous scene where George hits town. Look very closely to see a few rather special canine guest stars! Daddy's Favourite bit: Love the twist, the brilliant brilliant twist - and George is just such a wonderful creation. If your children already love Blue Kangaroo they are going to REALLY love this. Utterly and completely sublime, and we cannot wait for you to read it! Standing on the shoulders of literary giants is no easy task. Julia Donaldson is well established in her own right as a fantastic children's author with a wonderful gift for spinning the most amazing storyworlds from her rhymes. So it comes as no surprise that she's a huge fan of Edward Lear and his awesome mix of nonsense poetry and amazing characters. We've recently reviewed "The Owl and the Pussycat" with a foreword by Julia, and illustrated by the hugely talented Charlotte Voake, and it was so good to be able to familiarise Charlotte with the original poem, so brilliantly reprinted by Bloomsbury. So in a slightly disjointed turn of events, this book came out first but we're reviewing it second (now that a special edition with storytelling CD - read by Julia herself - comes with the book) and it's a sequel to the original poem? With us so far? Nope I'm completely lost too. 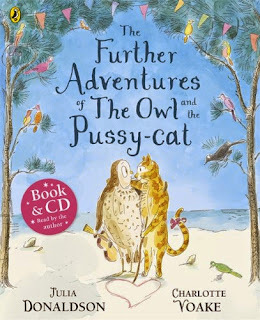 "The Further Adventures of the Owl and the Pussycat" reintroduces us to Owl, Pussycat and a cast of characters popping in for cameos from Edward Lear's other amazing nonsense poems (which we've recently been enjoying through Lear's brilliant poetry collections). The story concerns the theft of the Pussycat's wedding ring, which was carefully tied around her tail - but stolen by a naughty crow. The Owl and the Pussycat once more set off - this time in a beautiful green balloon - to track down the wedding ring, on a high adventures across land and sea - to the Chankly Bore and beyond! The new treatment works wonderfully in all but a few places, where the repetition taken from lines in the original poem doesn't quite 'fit' for us, and seems to jar a bit when reading aloud. It is inventive stuff though as you'd expect from Julia, and Charlotte's illustrations are wondrous. It's also rather nice to be able to sit back and let Julia read the story to us in her wonderful rumbling tones full of excitement and passion for the poem and her own treatment of it. Daddy's Favourite bit: The dong with the luminous nose! If your little ones are getting fidgety and running out of things to do, why not download and print a couple of awesome Shaun the Sheep colouring sheets to celebrate the release of "Shaun the Sheep: Christmas Bleatings" on Monday 3rd November. 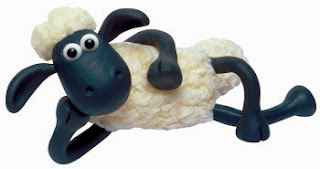 Stop by the Shaun the Sheep website for more details on the movie! Here's a great demonstration of how a children's non-fiction book can compete with the world of apps on an equal footing, providing a fantastic and fun reference tome that is interactive and positively encourages your little ones to explore and let their imaginations fly. 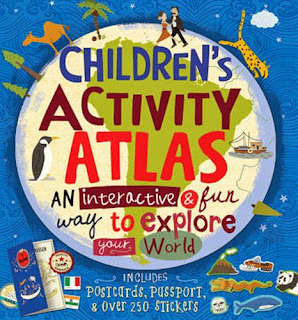 In "Children's Activity Atlas - An Interactive and Fun Way to Explore Your World" we take a trip around the globe with a truly gorgeous book packed with activities and facts. Children get their own passport in the pack, as well as over 250 stickers to use throughout the book. 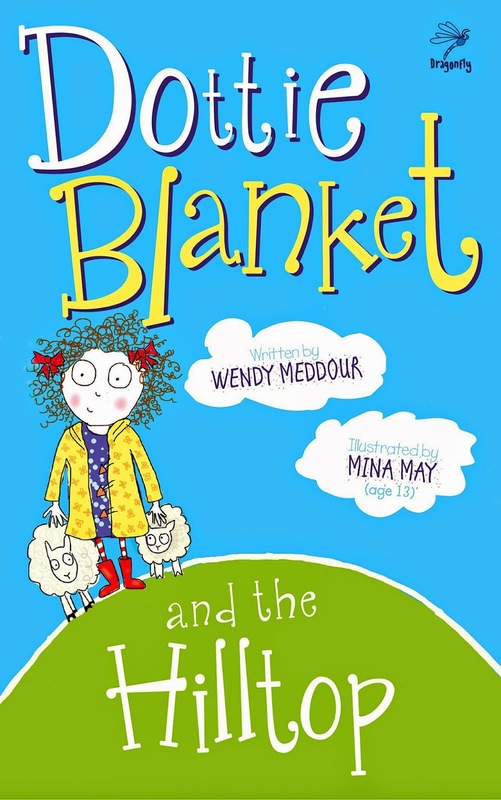 We've seen very similar books from Usborne and from Barefoot, and this is equally as good. 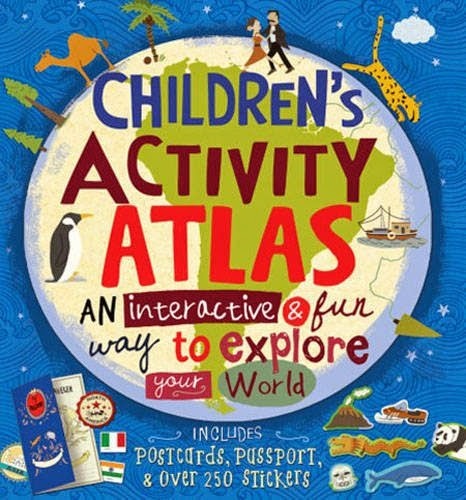 As children start to learn a little more in geography lessons at school, this book dishes up tons of interesting things to see, fascinating facts about each country, and helps children really dig into the subject in great detail. Charlotte's best bit: Having her own passport to mark off her journeys around the booky world! I must admit, I am allergic to gardening. I have the kiss of death for plants, and the only time I've ever managed to make a success of anything in our tiny patch is growing herbs - which I rather like because at least I can eat them afterwards. Charlotte loves gardening, for all the same reasons as the pint-sized green-fingered hero of Debi Gliori's latest story "Alfie in the Garden" does. It's the chance to enter another world, a leafy lush world filled with plants, insects, animals - and of course wonderful squishy mud. 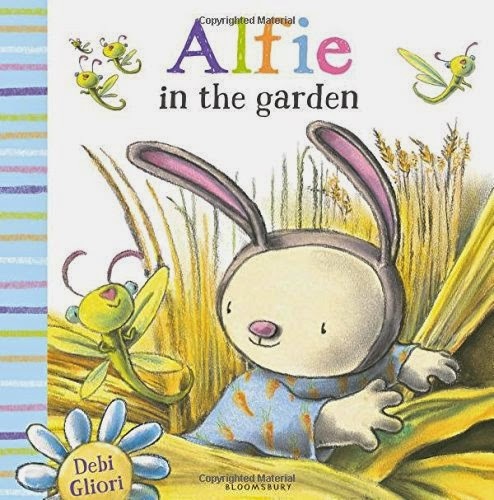 Alfie lets his imagination fly as he imagines his garden as a lush tropical jungle, or an unsurpassable mire. Debi's lilting storytelling and utterly delectable illustrations make for a cosy little read that is perfect for snuggle times! Charlotte's best bit: Mama Bun, the perfect hugger! Daddy's Favourite bit: Loving the way the story unfolds along with Alfie's imagination. Such a great little cuddly read! Children can't resist cleverness. Whether it's the subtle twist in a children's story, or the devil in the detail in a piece of illustration, kids can't help but admire folk who write and draw children's books. Of course, it goes without saying that they also develop huge respect for folk who can twist, turn and manipulate the English language to make them giggle and chortle, particularly in rhyme. During our latest library visit, Charlotte was really worked up about locating a book she'd spotted at school. "It's called 'The Works' Daddy" she exclaimed insistently, like I'd instantly have an encyclopaedic knowledge of all books called "The Works". Her second clue was more helpful though. "It's the book with the Ning Nang Nong in it!" 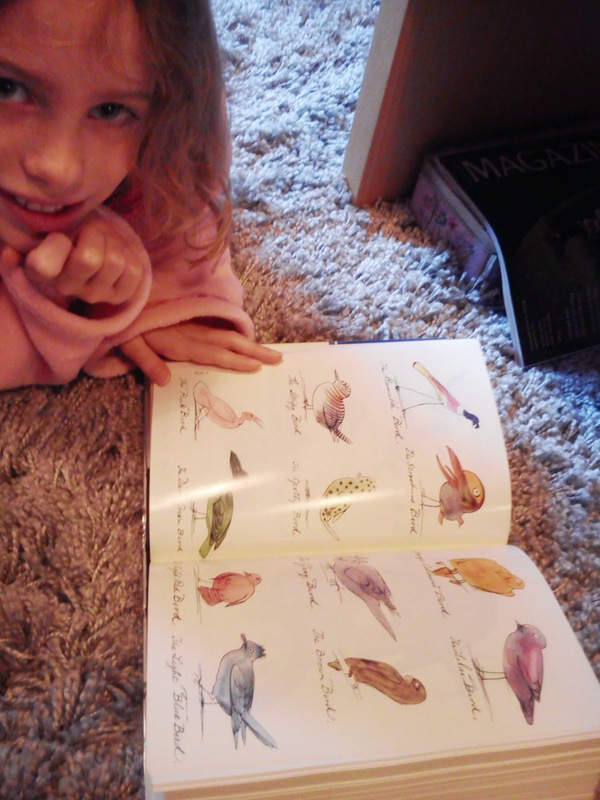 Charlotte digs into a fantastic Edward Lear anthology before breakfast! 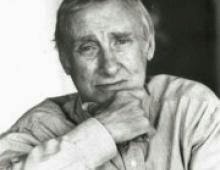 I had Spike Milligan nagging at the back of my brain and of course most folk will know that Mr Milligan the Milligoon himself had penned "Ning Nang Nong" and other hilarious rib-tickling poems for children. Alas we came home empty handed but did at least find said poem on the internet later on. Nonsense poetry is truly a fine art and though Charlotte turned her nose up at "Twas Brillig and the Slythy Toves", we enjoyed digging through the poetry books at home to find the finest works of such literary poetry luminaries as Milligan, Lear, Lewis Carroll and our fave Twitter superstar chum Colin West (do drop by his website, it's absolutely chock full of gloriously funny poetry). As soon as children discover that they can come up with their own rhymes, they take to poetry like ducks to water. Even the most hardened book-dodging adults if pressed will be able to name (or even recite off by heart) a favourite rhyme, which shows how fantastic poetry is for engaging readers at an early age and keep them reading well into adulthood. Lear's amazingly inventive bird illustrations. Gorgeous! It's not too difficult to nurture a love of poems and rhymes, after all, there's a huge number of children's picture books that resort to rhyme to carry a story, so the chances are you're already halfway there! Limericks (though keep 'em clean, obviously!) - Edward Lear discovered the joys of limericks and came up with some corkers during his literary career. Word Clouds - Get a piece of paper and draw a huge cloud on it. Get children to shout out words that rhyme so you can write them down, or if they can write themselves encourage them to get their coloured pencils out and write their own suggestions! For more ideas, here's a collection of links to poems and resources we've enjoyed on the blog previously. Dig in, there's truly something for everyone! More Edward Lear on our "Read it Mummies and Daddies" poetry week! 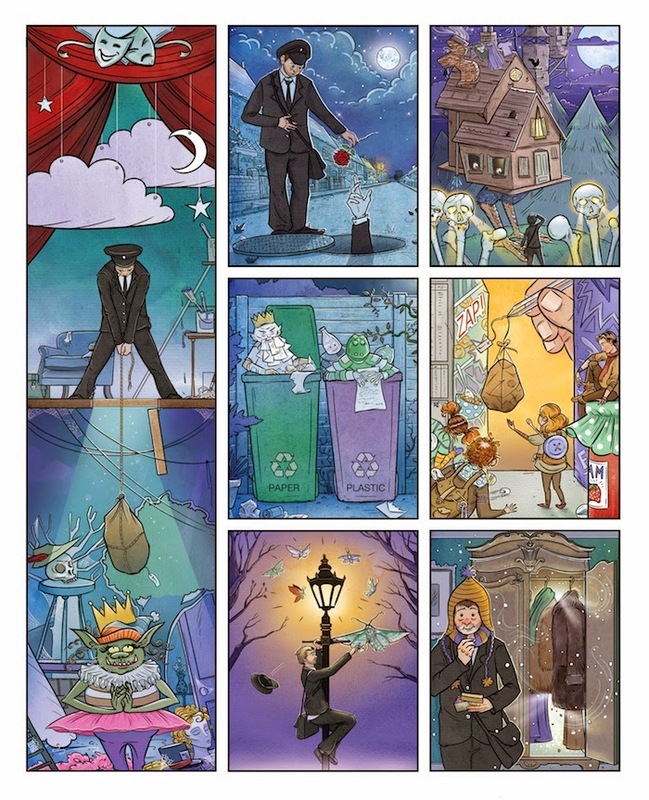 The fabulous "Book of Nonsense" from Colin West - now available on iPad! Rachel Lyon's second book for Maverick (the first being the rather excellent "The Cautionary Tale of the Childe of Hale") takes an entirely different tack and deals with a rather tricky problem. Ponginess. Well it's not an easy subject to broach with someone is it, if they're a bit whiffy. 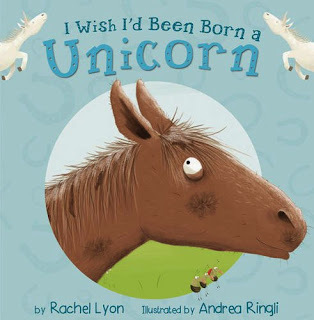 In "I Wish I'd Been Born a Unicorn" a horse has more than a slight odour problem. In fact he downright pongs to high heaven but is happy with life, rolling in mud and gadding about with scarcely a thought of baths or showers. It does get a bit lonely when you're a bit smelly though, and the poor horse truly believes that life might've been completely different if only they'd been born a unicorn. Unicorns are popular, unicorns are well loved, everyone wants to prance and play with unicorns? Seeing the poor horse's dour mood, his friends decide to help. Armed with the means and the method to make a radical change, overnight they transform the whiffy pony into something quite magical. The whiffy steed becomes amazingly popular, but with dark clouds looming on the horizon and rain threatening to undo his disguise, will life as a unicorn be a fleeting thing? We loved this, it's such an original idea and beautifully flows as we read aloud together. Teaching valuable lessons that someone's inner worth isn't dictated by personal appearance (or ponginess), it's a great little story! Daddy's Favourite bit: Superbly written and illustrated, wonderfully original and entertaining! At one point or another, children are going to end up owning a bear. Be it a scruffy hand-me-down from mum and dad, or a cuddly fluffy creation fresh off the shelf of the local toy store - or best of all, a hand-knitted bear that a relative or friend has poured their time or their love into. 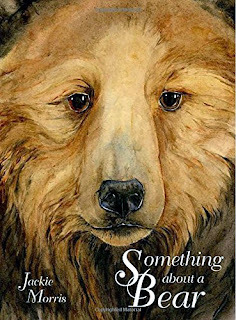 Children love bears and they most certainly love finding out more about real animals so it's been a privilege to be able to take a look at Jackie Morris' new book celebrating bruins and browns, grizzlies and panda. There truly is "Something about a Bear"
Jackie's books are works of art in their own right, so we don't just get to learn a little more about bears, we get to gaze at their splendour through her utterly gorgeous illustrations and gentle lilting words. In this luxurious book, children will absolutely identify their favourite bears early on and will love diving to the end of the book to see where they live, what they eat and what they get up to during their daily lives. It's a real pleasure to read, from the striking cover to the end-papers at the back. Definitely a keeper this, and one that you can see your children hanging on to, to hand on to their children one day too. Charlotte's best bear: It was a very close call between the Polar Bear and the Panda in this book, both are absolutely wonderfully depicted. Daddy's Favourite bear: I've always been a real sucker for a spectacled bear myself (possibly a lot to do with Paddington books from childhood). What an utterly glorious book though, bear-illiant in fact! Have you any idea what goes on at ground level in your garden when you're not looking? If you did, you'd probably run screaming into the trees but take a trip with us between the blades of grass in Gary's Garden. Gary Northfield that is, owner of the Supreme Beard D'Honour, model for an exclusive range of Gary Northfield-shaped Lindt Chocolates (not really), but certainly a keen observer of garden life whether it be microscopic and insect-like, or feathery and bird-brained. Gary's Garden runs as a regular strip in The Phoenix Comic and is always keenly observed and bang-up-to-the-minute topical. We've giggled as insects enter talent contests, we've hooted with laughter at dappy clubs like "Club for people who own stones shaped like faces Anonymous" and we both love the complete chaos and insanity of it all, imagining Gary working hard in his studio dreaming up new and crazy ways to spin stories of garden goings-on. Collected together here in Book 1 as part of The Phoenix Presents range, this is awesomely rib-tickling stuff. Get on down to the garden with Gary today! 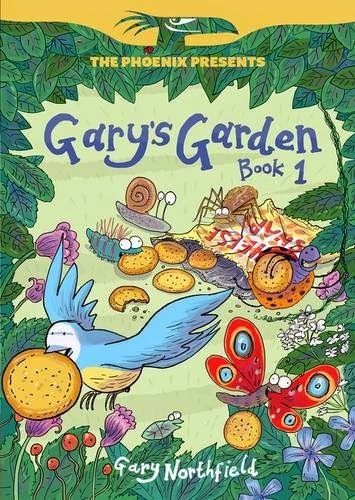 "Gary's Garden Book 1" by Gary Northfield is out now from David Fickling Books. Charlotte's best bit: Who knew that caterpillars led such interesting (and farty) lives! Daddy's Favourite bit: A machine-gun gardening hoot-a-minute! 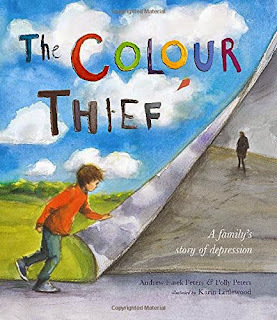 Not to be confused with Gabriel Alborozo's awesome book, "The Colour Thief - A Family's Story of Depression" deals with one of the hardest subjects to broach for younger readers. It's also a very tough book to review without sounding slightly ham-fisted about the subject, but we will try our best. Andrew Fusek-Peters and Penny Peters have written the story of a young boy who sees his father's behaviour and whole outlook on life radically change as he begins to suffer from depression. 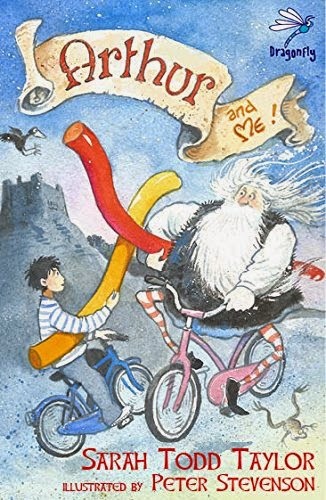 The story, along with accompanying illustrations from Karin Littlewood, caringly and touchingly describes how the dad changes, subtly at first but more pronounced as depression takes hold - and reinforces the point that the boy may feel that he's somehow to blame (but obviously isn't). Powerful allusions are made, comparing depression to feeling like being trapped in a block of ice, with life on pause though obviously life goes on. The book's illustrations change in tone from colourful and happy, to dark and cloudy. Showing that help can be sought and that it takes a long time sometimes for that help to become effective, it answers many of the questions children might have but perhaps can't seek from their family members directly involved. We've only seen one other book on the blog that touches on this most sensitive subject (Shaun Tan's "The Red Tree" also makes reference to depression in many ways), but "The Colour Thief" more directly maps to real-life situations that children can perhaps more readily and clearly identify with. A hugely important book, expertly developed and written and something that would be a huge huge help for children struggling to understand the symptoms and the changes that depression can cause. Daddy's Favourite bit: An expert and sensitive treatment of a hugely difficult subject to put across in understandable terms for children, but a book that will be a real help to children in families where a member suffers from depression. Important, and deserving of a gigantic amount of recognition. It's never really 'sat' well with me that so many things are neatly categorised, compartmentalised - or for want of a better word pigeonholed. In the world of books, this sort of thing is widespread and though there's a fair justification for ensuring that age inappropriate stuff doesn't get into children's hands, there's one aspect of this that impacts this humble book blog more than any other. "Why don't you show age ratings against your book reviews?" It's a fair question, and it was something that was initially planned when we kicked this whole thing off in 2010 when Charlotte was 2. 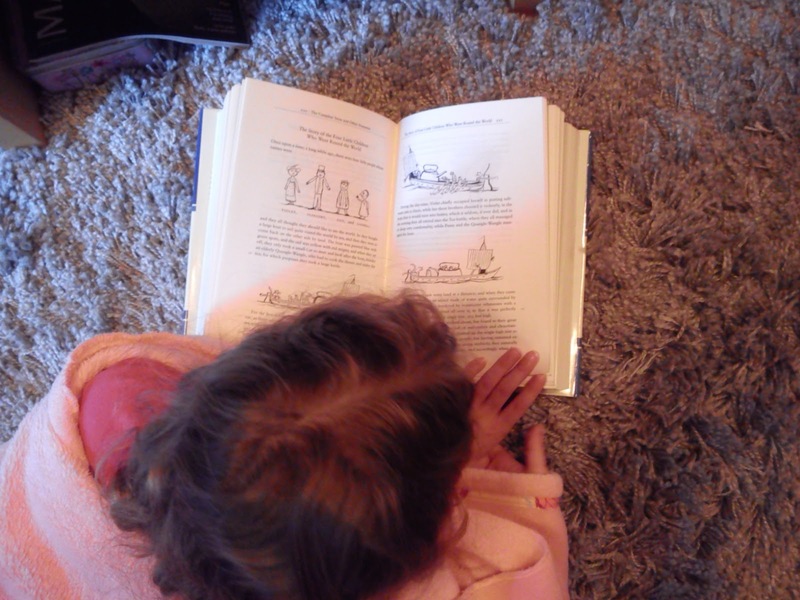 Back then, we read and enjoyed a whole range of children's picture books from the extremely simple but effective board and baby books, right through to books that Charlotte still enjoys regularly today. Age ratings on books fall into a few categories. 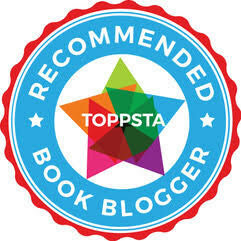 They can be applied by the publisher, or the marketing team, even by bigger and better book reviewing folk than ourselves or perhaps by various awards agencies, book trusts and collectives. I remember reading James Herbert books as a wayward 12 year old simply because no one told me I couldn't (and of course reading "The Rats" as an impressionable pre-teen was a bit of an eye-opener to say the least). That's not to say that I would approve of a ratings system that slapped a big fat "15" on the cover (or back cover) of your favourite reading material. So I guess the question to raise is "should we age-rate books or issue our own guidance ratings?" - We could but then are we authoritative enough to do so? After all, Charlotte's own reading tastes swing wildly from lift the flap and board books (if they're entertaining enough for her) right through to things that she would probably be ideally reading in a year or two's time (not YA of course but she's itching to get cracking on the Harry Potter books and I'm not sure I could comfortably let her loose on the later ones). If we did so we'd have to attach all sorts of caveats to our recommendations so would there really be any point? It's a topic ripe for debate - and if you do have any views, I would dearly welcome a comment or two below. Imagine waking up after a traumatic incident to find that the world you once knew had disappeared, and worse still, your hair had turned completely white. To add insult to injury you also find that your surroundings are less than hospitable, and you are - in fact - constantly referred to as "Old deady-chops over there". 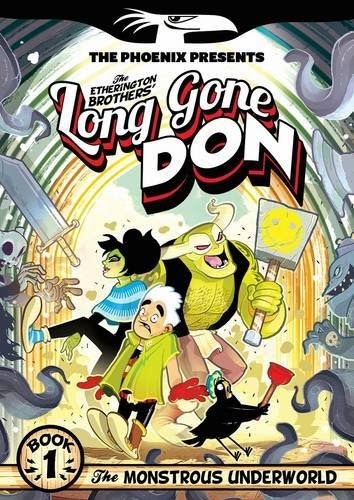 Welcome to the world of Long Gone Don, one of the coolest comic strips in the fabulous Phoenix Comic, wrought by the expert hands of The Etherington Brothers (Lorenzo and Robin). Somehow we'd managed to miss the very start of Don's adventures, so here we find him as a true fish out of water, wandering the dark and gloomy confines of "BroilerDoom" - a place that's as warm and welcoming as a wet weekend in the local sewage works. Thankfully help is at hand, A sassy hispanic crow called Castanet helps guide (if guide is quite the right world) Don through the underworld, teaming up with a motley collection of miscreants that make the Guardians of the Galaxy look like a local sewing circle. It's brilliantly told, gorgeously illustrated stuff and we've been hooked on this book since it fluttered through our letterbox. 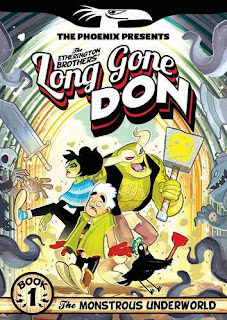 "Long Gone Don Volume 1" by Lorenzo and Robin Etherington, is out now from David Fickling Books. Don't be late for your own death! Daddy's Favourite bit: Utterly in love with this strip, packed to the gills with hilarious comic asides and gorgeous details in the art. More soon please! 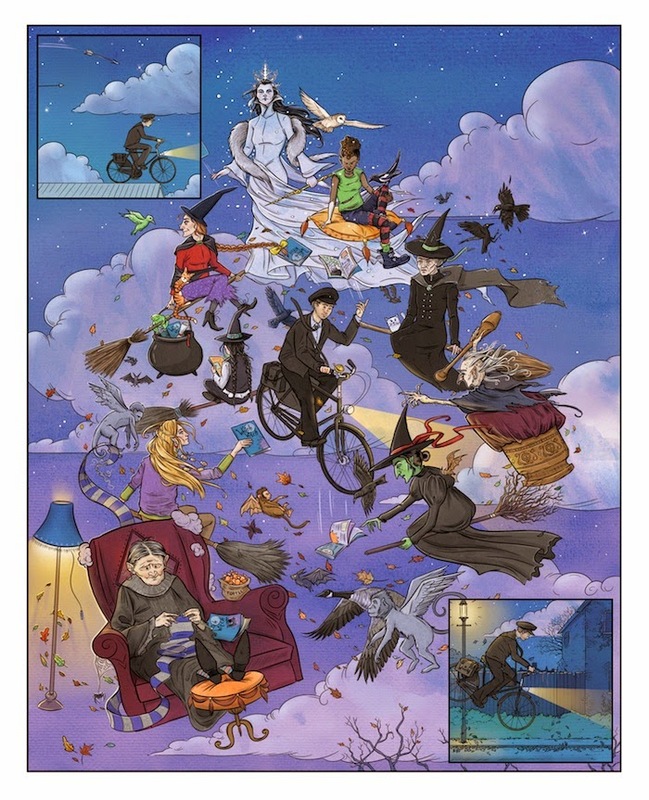 A spookily brilliant half term planned at Oxford's Story Museum. The awesome Malorie Blackman as the Wicked Witch of the West. Just one of the highlights of the 26 Characters Exhibition! Halloween comes at the end of the October Half Term, so The Story Museum has a truly horrible holiday planned! 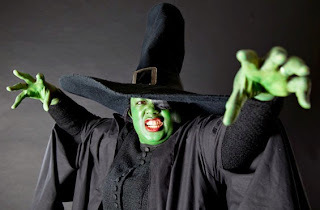 The Museum’s popular 26 Characters exhibition continues, featuring a galaxy of Britain’s well-loved authors transformed into their favourite childhood fictional characters, captured by celebrity portrait photographer Cambridge Jones. Each portrait is hung in an interactive themed space: walk through the wardrobe and into Narnia, explore the deck of a pirate ship, and peep into the Borrowers’ living room to explore the characters’ worlds, and hear extracts from their stories read by Olivia Colman and Christopher Eccleston. There are treats in store for comics fans: Sarah McIntyre and David O’Connell will run a family workshop, Jampire Jamboree, and David will lead a Cartoon Workshop for young artists (Tuesday 28 October). 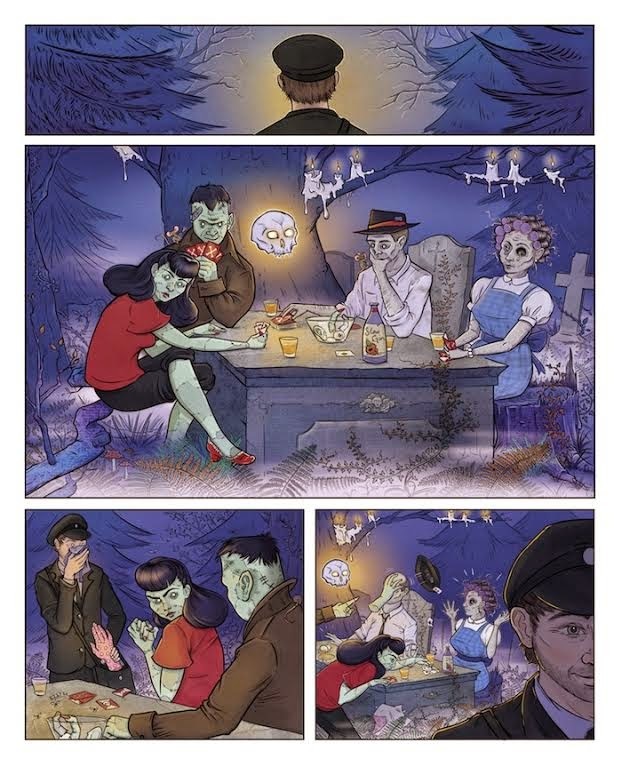 Phoenix comic artist (creator of Corpse Talk, the show that brings the dead famous to life) Adam Murphy is in town on Friday 31 October for two sessions: Adam Murphy Masterclass (11.00) and Halloween Corpse Talk (14.00). Things get spooky on Thursday 30 October, when Dave Shelton (author of A Boy, A Bear and a Boat and the curiously creepy Thirteen Chairs) will be teaching young writers how to handle horror (Spooky Stories Workshop, 14.00), and then telling Ghost Stories at 18.00. Dress up and learn the Monster Mash and Thriller dance moves at our disco for the undead, Zombie Zumba (12.30 & 15.00). For a touch of magic, try the Quidditch Demonstration at 15.00 on Thursday 30 October – learn the rule of the wizarding sport (from the Harry Potter books) and have a go yourself. Science Oxford will be bringing their magic show with a twist, Magic and Science, on Wednesday 29 October for two performances at 11.30 and 14.00. Dive head-first into Oxford’s myths and legends with the Wonder Walks: playful family story tours of the historic city. Free event Reading Allowed! continues, with The Wizard of Oz read aloud by visiting guests every Sunday. Tickets for all events can be booked through Tickets Oxford: www.ticketsoxford.com, or 01865 305305. We take a sneaky preview peek at an awesome new Comic and comic workshop project coming from the fabulous Art Heroes! Art Heroes - Comic heroes ready to rock your world! Who are the mysterious "Art Heroes"? They're a British publisher and comics workshop facilitation team who passionately beaver away producing brilliant comics and mould-breaking stories and heroes that you're seriously going to go nuts over. The awesome team got in touch to let us know that today, 22nd October, is the launch day for "Endangered & More Strange Stories", a full colour, all-ages comics anthology. 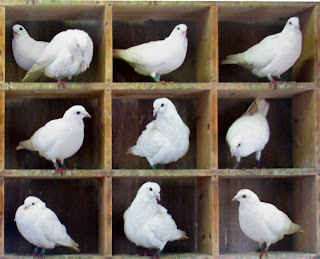 "Birds of Pray" - They're not angry, they're holy! Art Heroes don't just produce awesome comics - Endangered & More Strange Stories also includes material culled from Art Heroes workshops designed to encourage kids to pick up a pen or pencil. 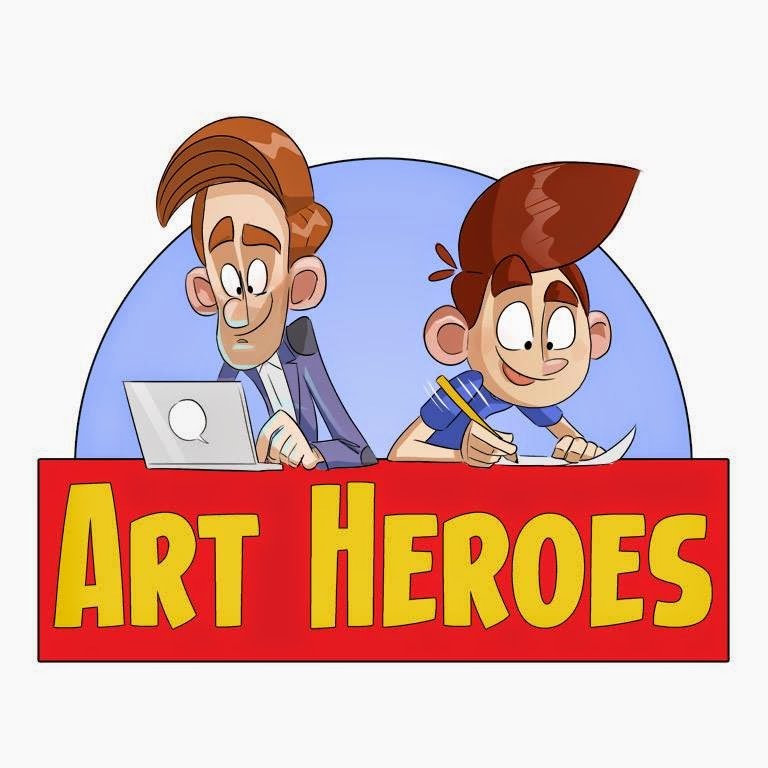 As we've often found in chats with comics-ey folk we get to talk to through the blog, there's no better way to engage kids with creativity and storytelling than letting them loose creating their own comics, and that's something Art Heroes are extremely passionate about. 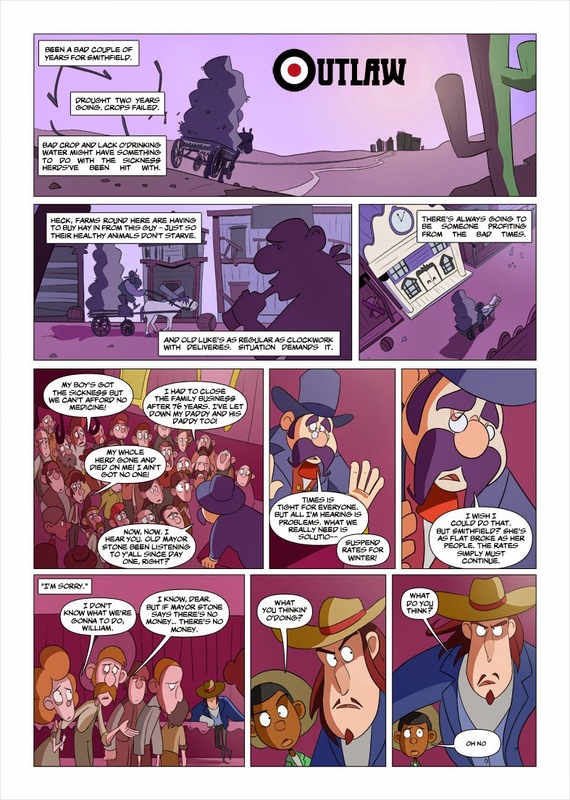 "Outlaw" - The Weird Weird Weird Weird West! Offering 36 full-colour pages for just £3.50, Endangered & More Strange Stories is available now from ArtHeroes.co.uk and will be on sale in select retailers soon. Art Heroes is also holding a special launch event for the comic at Newcastle City Library on Saturday October 25th. Lee and Daniel will be on-hand to hold a free kids' workshop on time travel and scary comics as well as sign and sketch in copies of the anthology. "Endangered and More Strange Stories" from the awesome Art Heroes Collective. Get your copy for a mere £3.50 in earth money. BARG-AIN! We'll be taking a closer look at "Endangered and Other Strange Stories" with a preview very very soon, and if we can nab a bit of the team's valuable time we'll be interviewing them about their influences and other cool comics-ey style stuff. Halloween is coming, and all the ghoulies and ghosties are at their most mischievous. But little girls aren't fooled by such things. "There's No Such Thing!" proclaims the petite heroine of this story. All the same, strange things keep happening around the house. Socks disappear (yes! ), headphones get tangled, things fall off shelves. Could there be a supernatural explanation after all? "No such thing!" says the girl. 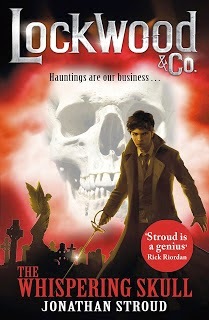 As ever, Flying Eye books have put together something magical - and just a little spooky too. 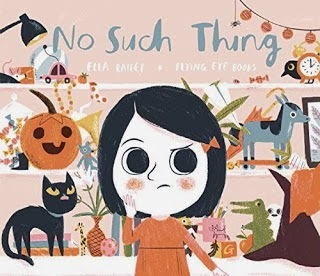 Ella Bailey's bold artwork and wonderful insights into the inner workings of a child's mind blend together perfectly for a hoot of a story. Children will absolutely love spotting those naughty ghosts in each page spread (some are so sneakily hidden that it's very satisfying when you finally spot a ghostly foot or a pair of tiny ghostly eyes peeping out from behind cover). Perfectly timed for a bit of trick or treating! Charlotte's best bit: Charlotte felt sorry for the poor cat, who was blamed for knocking things over when it was really those naughty poltergeists! Daddy's Favourite bit: Flowing rhymes, great 'spot the ghosties' fun and our first Halloween story of 2014 - C'est awesome! Sleepy snoozy sloths. It's amazing how an animal that can spend up to 20 hours a day snoozing can be such an appealing character for a book. 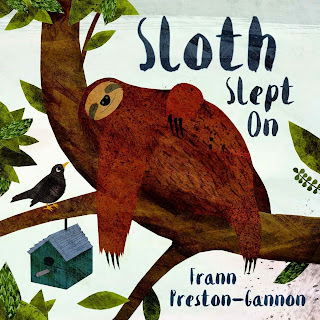 We already know Frann Preston-Gannon has a gift for writing awesome dinosaur stories (we've loved her Dinosaur Farm books) and we also loved the racey chase around the world in "How to Lose a Lemur" - But can Frann make a simple sloth loveable too? The answer is (of course) yes and Sloth is discovered by a group of kids hanging from their tree fast asleep one day. The children have never seen a sloth before so try to figure out what he is, where he comes from and what he might like to eat. The tiniest tot finds a picture of the sloth in a book, and soon learns all about him - while her older siblings are still trying to work out if it's a space creature or perhaps something from the briny deep. Eventually tiny tot is listened to, and they hatch a plan to help poor Sloth get back to where he belongs. Charlotte's best bit: We don't want to spoil the end but that last double page spread is an absolute cracker! Daddy's Favourite bit: Not difficult to see why Frann garnered a Sendak fellowship, she absolutely ROCKS! 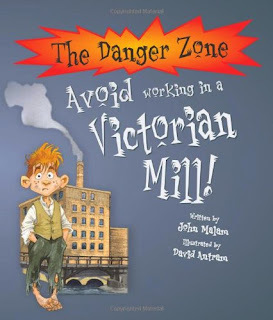 In "Avoid Working in a Victorian Mill" kids are in the firing line once again, as we find out how young children were often pressed into service at their local textile factories and mills. Children as young as Charlotte would be given dangerous and hazardous tasks, expected to learn their trade quickly, and often be paid a pittance in return. Dangers such as horrible lung diseases brought on by breathing cloth fibres, or losing fingers to whirling twirling machinery were just some of the nasties to avoid. Children's history books have been given a vital shot in the arm in recent years by things like "Horrible Histories" but this range stands out on its own merits, purely because it serves up such a great range of subjects and fascinating facts presented in detailed layouts throughout the whole book. If you have children who think history is a complete bore, turn them onto this series - they might just change their minds - and they'll certainly be glad they don't live in Victorian times. 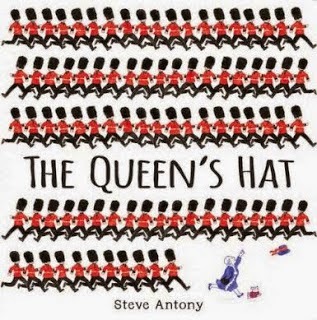 "The Queen's Hat" by Steve Antony (Hodder) - Well deserved Kate Greenaway Nominee and former Book of the Week! We've just been cooing over the latest list for the CILIP Kate Greenaway Medal Nominations for 2015 and it's an utterly glorious list of children's books, showing just how brilliant a year it's been for amazing stories, gorgeous illustrations and wholly original ideas. 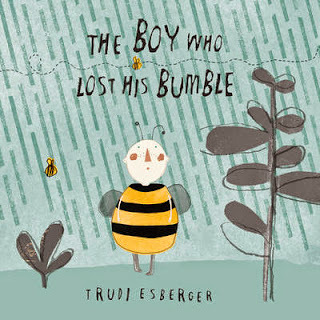 A whopping 16 of the picture book nominees have graced our "Book of the Week" slot over the last year or so, so let's take a closer look at the nominees that also won big on our humble little book blog. I'm sure you'll agree that there are some stunners there, and quite a lot of the other nominees that didn't quite make Book of the Week were also praised very highly in our reviews. To see the full list, check out the link here. Welcome to another edition of our occasional roundup of Early Reader and Chapter Books. We've got some corkers lined up for you so without further ado, let's dive in with some of Charlotte's favourite current reads. First up, the return of an old favourite! Bob - the infamous Man in the moon, and his (not an alien, honestly) dog Barry are back in another cracking chapter version of the brilliant "Bob" books. This time, Bob isn't quite feeling himself. He has an odd craving for meat, a rather problematic issue with wind (and we're not talking about the sort that you can fly kites in - although you could try! ), and unsightly hair sprouting all over his face and head (not to mention fangs). What could possibly be the cause of Bob's radical change? Could it have something to do with certain tiny microscopic visitors Barry has brought home to stay? So what's next in our book bag? For all those of you who are absolutely nutty about "The Wimpy Kid" here's another hero cut from the same slightly shaky cloth. 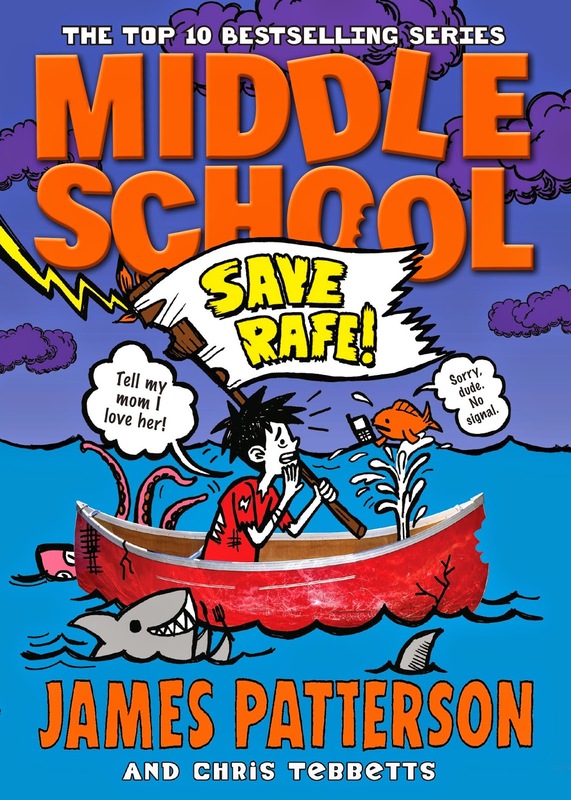 In "Middle School - Save Rafe!" our titular hero is back, facing being kept back a year at school if he can't fave up to a rather unusual challenge. Can Rafe survive the rugged outdoors and complete an outward bound course? Hilarious rib-ticklingly funny situations abound with ace illustrations from Chris Tebbetts. Give this a shot if you're all wimped out! We've been enjoying the Firefly and Dragonfly range of books from the awesome new Welsh publishers, who are fully supporting the Welsh Government's new junior literacy initiatives. We've been taking a look at the autumn roundup and there's truly something for everyone. First up, we've really been into exploring Arthurian Legend lately - so this book arrived with perfect timing. Imagine (if you can) what would happen if an ordinary everyday schoolboy managed to resurrect the legendary king and warrior - and found that Arthur, King of the Britons, wasn't quite as legendary as expected. Magic, mystery and a spot of shed-sitting are on the menu for our next book from the Dragonfly autumn lineup. 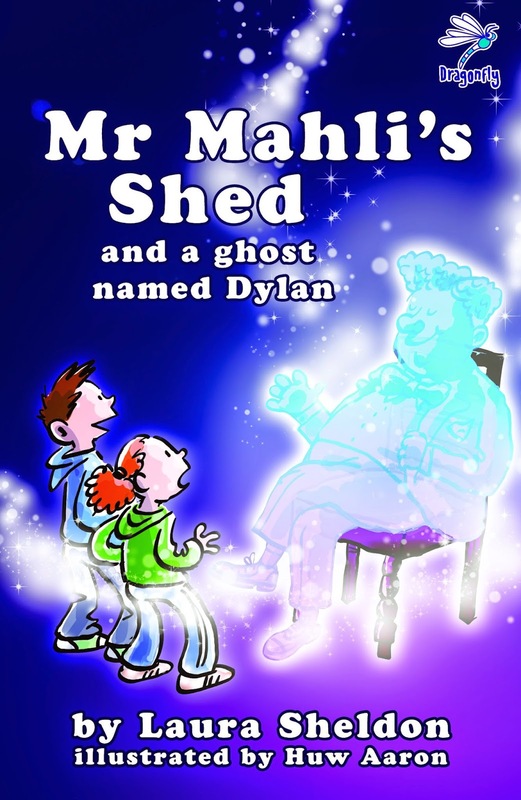 Young Tomos and Alys offer to look after Mr Mahli's garden and don't realise that his shed holds spooky secrets that soon embroil them in a decidedly odd adventure. It's full of humour and more than a few unexpected twists. Come on down to the shed, it's storytime! More? You want more? Oh you lot, we can never say no to you...! Meet Dottie Blanket, a girl who has a magical opportunity to make one wish. When life takes a slightly worrying turn after Mr Blanket (her Dad) loses his job, Dottie closes her eyes and makes a wish. "I wish I lived on a bright green hilltop" she says, and before she can blink twice, Dottie is whisked away - and finds herself exactly where she wished to be! It's a slightly surreal and decidedly odd little book this, but hilariously funny and we particularly loved Mina May's illustrations. She's only 13 and obviously has a bright illustrative career ahead of her, as her drawings are AWESOME! With perfect timing just in time for Halloween, here's a spooky story of a young boy named Pete - and his brilliant companion Blob (who just happens to be a Basset Hound). While out walking one evening, Pete and Blob spy strange goings-on in their local park. Strange flapping creatures emerge from the darkness, hell-bent on sucking his blood! That's the least of Pete's troubles as there are more spooky creatures lurking. Werewolves, Hell Hounds and Bwcas (I had to do a quick google to find out what a Bwca is - and I wish I hadn't!) How on earth can Pete defeat such evil foes? Or are they just out for a night of partying at the local fancy dress evening? Hope you've enjoyed our Chapter Book roundup for October. Join us again next month when we take a look at another brilliant selection! 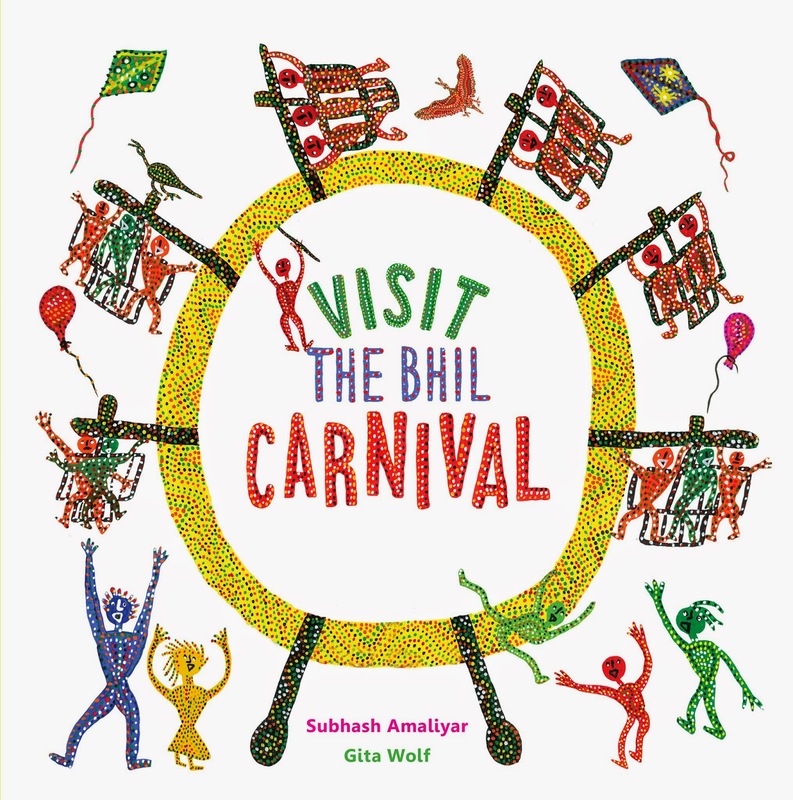 The sights, the sounds, the colours and the spectacle of the Bhil Carnival known as Bhagoria is the subject of this gorgeous and colourful book, with more than a few surprises tucked in between its pages. Neela and Peela are two children who cannot wait to dash to the carnival this year, and we're fortunate enough to be able to join them! Decked out in traditional Bhil style by artist Subhash Amaliyar, with an entertaining storybook tucked away in the corner telling us of Neela and Peela's adventures at the carnival, this is definitely something special. We love the way the book unfolds into a huge layout of the carnival, so as you read the story you can have fun spotting all the sights that Neela and Peela see as they spend a fantastic day there. What a brilliant way to share a traditional indian fair! Charlotte's best bit: The mouthwatering descriptions of lovely ice creams, and the quite scary description of how the Ferris Wheel works! Eeks! Daddy's Favourite bit: A colourful and dazzling book that shows off perfectly the amazing spectacle of a traditional indian carnival. 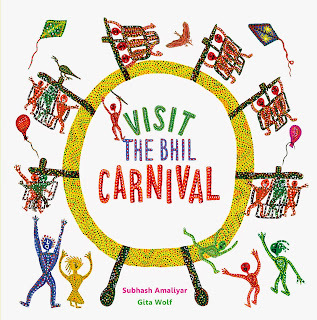 We truly wish we could really visit the Bhil Carnival but this is a wonderful way to catch a glimpse of it ourselves! We read books at all hours of the day and night but some books just BEG to be read just before Charlotte snuggles down to sleep. "My Little Star" is just such a book, celebrating the special bond between little ones and their parents by looking at mums, dads and babies in the animal kingdom. 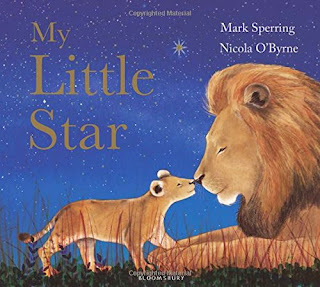 Mark Sperring's gorgeous poetic story complimented by Nicola O'Byrne's cuddly and fuzzy illustrations have provided us the perfect opportunity to read this book together, snuggled up and getting ready for a good night's sleep. I always look for books that I can read to and with Charlotte where she can pick up some of the lines and we almost 'act out' what we read as we go through the story. "My Little Star" has lovely elements of repetition and aside from Charlotte's very good point about owls settling down to sleep ("They don't do that, daddy!" - so I swiftly pointed out that they might be snuggling up just before dawn breaks!) this is destined to become a bit of a bedtime classic. With the long hot summer, we often found ourselves disappearing into the wild countryside immersing ourselves in nature. Charlotte absolutely loves our trips out to BBONT or National Trust places, and you can read all about our buzzy bee adventures over at my wife's blog - Can I Walk Mummy. On one trip, we had a mission in mind and when Child's Play got in touch with us to tell us about an amazing new book called "The Boy Who Lost His Bumble" we thought we'd tie in our review with some important bee-themed posts. Check out our homage to bees when we tried to photograph them on a trip to Waddesdon Manor. Let's get back to the book though. Not only is it a wonderful homage to arguably our most important insect species, but a celebration of the four seasons - and the bee-buzzy boy who absolutely loves his garden. Charlotte loves the story very much, and also loves the fact that we get to learn a lot more about bees at the end of the book, just how important they are, and also how you can grow your own plants to attract these busy little insects to your garden too. Do you have a knitting nan or gran? Nan Webb was always the biggest knit(ter) in our family, she could hand-knit and crochet such amazing things in fact if anyone had asked her she could probably have knitted a Nuclear Submarine Cosy, she was that good! Granny Mutton loves knitting so when Lionel Mutton (her grandson) is about to have a birthday, Granny gets busy and decides to knit young Lionel a scarf to keep his neck warm. Granny can't reign in her enthusiasm, with needles almost on fire with the effort she knits the scarf to end all scarves - in fact it's a scarf and a half! 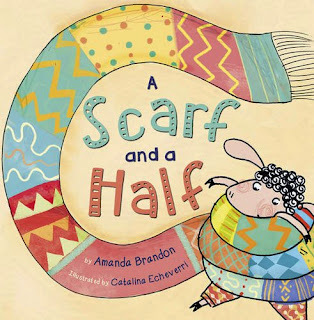 "A Scarf and a Half" is awesome, a rousing cheer for our wonderful grandparents (or for that matter dotty old aunties or mums who knit too!) and an awesome demonstration that a child's imagination through play can help any ordinary everyday object become something magical! A book and a half, this! Charlotte's best bit: Lionel's scarf tug-o-war! Daddy's Favourite bit: What a wonderful granny Granny Mutton is! Now and again we're reminded of how powerful children's books can be for imparting wise messages. 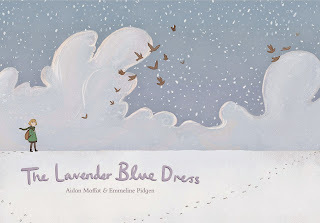 In "The Lavender Blue Dress" there's a whomping great big heartfelt message in the story of Mabel, a little girl who has all the same hopes, dreams and aspirations as other little girls. Mabel, however, comes from a poor family so as other little girls at her school are dreaming of amazing gowns and outfits for the Christmas Ball, Mabel knows that her own wardrobe only contains shabby moth-eaten dresses. The date approaches and though Mabel dreams of the perfect lavender blue dress, a blue so bright and gorgeous that it would shine out amongst the rest, she knows deep down in her heart that her family would never be able to afford a new outfit. Charlotte really loved this story, that has a little dash of Cinderella and a jot of "Charlie and the Chocolate Factory" threaded into its touching story. 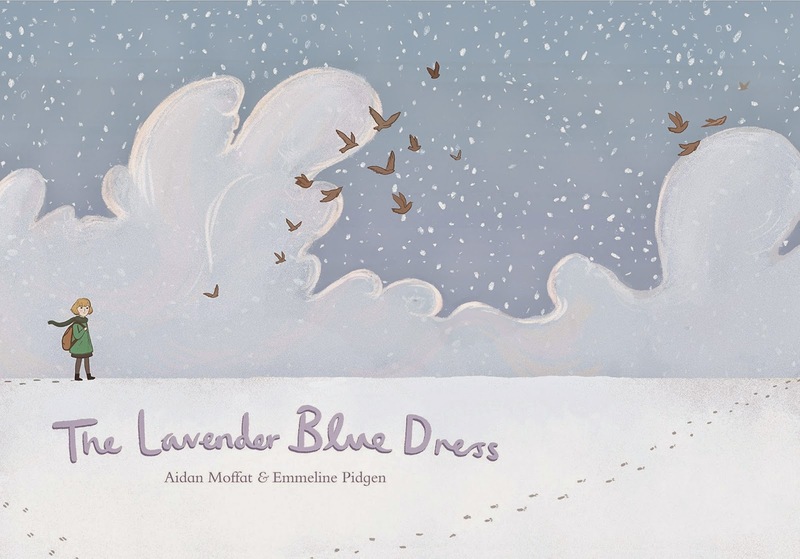 We truly loved Emmeline Pidgen's utterly perfect artwork too, which suits the story so well. There's a story CD tucked into the back of the book as well, which is delightful (though be extremely careful extracting it from its sleeve, it's well and truly stuck on and not easy to detach from the book without damaging it. Curl up with this gorgeous slightly christmassy classic, it's absolutely bound to melt your heart. Daddy's Favourite bit: A touching and heartfelt message in a gloriously presented book, utterly superb!